Flying Eye Books | Scandinavian Adventures! 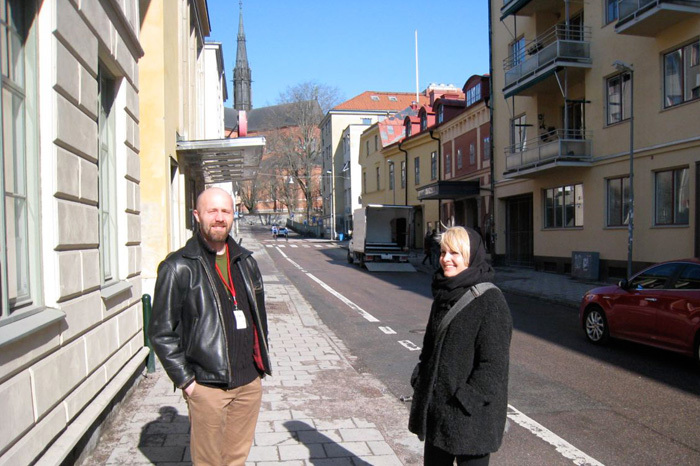 A couple of weeks back I boarded a flight headed for Sweden and the Uppsala Comix Festival. On landing at Stockholm’s Arlanda airport I was greeted by grey skies, drizzle and a decidedly cold Scandinavian day. Thankfully this was the only chilly reception that I received. Uppsala is Sweden’s fourth largest city and it’s a really pretty place with a big student population – so a great place for a comics festival. Although it’s a small festival it was really well attended and people came to spend money. 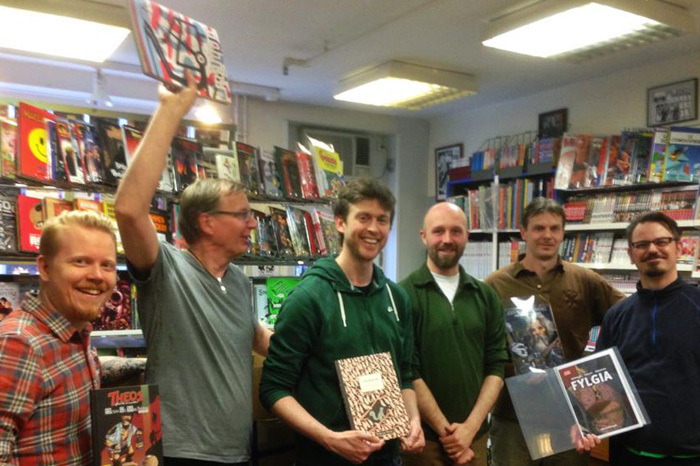 Christer, Harri and the guys at SerieZonen (Uppsala’s best and only comics shop!) did a great job and organised the event at an amazing old art deco cinema – it was really the perfect location. On the day we were even blessed with blue skies and sunshine. 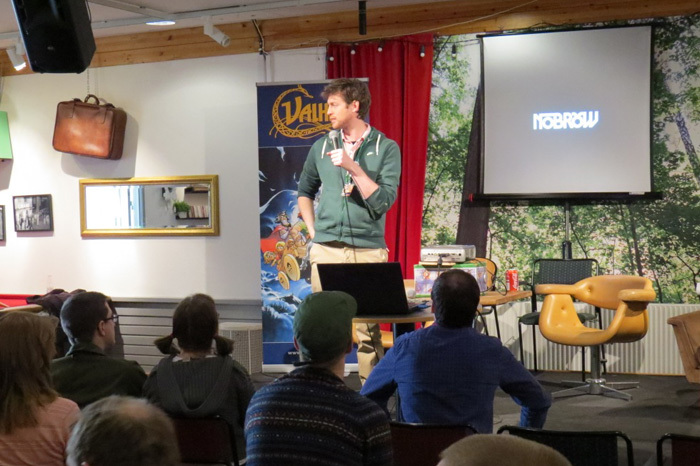 A big thank you to everyone who came along to my talk and to everyone at at Uppsala Comix – especially Jonas Anderson for helping me out on the stall – hearing Luke Pearson’s Nordic inspired Hilda series being explained in Swedish to a customer was really my highlight! Also a big shout to some great Swedish publishers that I had the pleasure of meeting – definitely worth checking them all out: Sara Granér and her publisher Galago, Daniel Thollin, Jens Andersson is publishing some really beautiful books, his Edward Gorey book is excellent and one of my favourite ‘I wish we published that!’ books is The First in Line by Mattias Adolfsson. And if that wasn’t enough Scandinavian-ness for you, we also had books on sale at the Stockholm Comix Festival the weekend just passed – thanks to them – and we will have a good presence at the Oslo Comics Festival, with Luke Pearson being one of their official guests there in June. Also a good mention lastly for Staffars Serier – Stockholm’s comics store where you can also find our books! 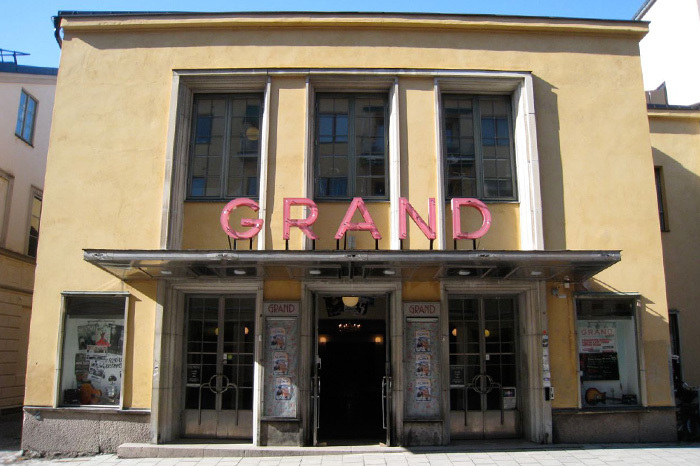 Uppsala’s venue for the Comix Festival – what a beautiful building! Sam Arthur giving his talk and wondering where he left his suitcase….